Happy St. Patrick’s Day! For St. Patty’s, I decided I wanted to stick to traditional Irish fare as much as possible, no green-coloured food unless it was natural such as veggies, for example. I’d really wanted to make soda bread, with Elizabeth Barbone’s recipe on Serious Eats, but this did not entirely work out in time for me to make it and put it on the blog with enough time before St. Patrick’s Day. 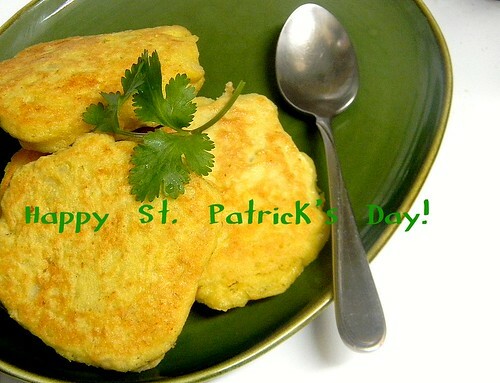 Instead, I’m proffering boxty: potato pancakes, which, according to the recipe I adapted, are traditionally served at the Celtic New Year but I’ve also read from another online source that they are, again traditionally, served on St. Bridget’s Day. Whatever the case, they are positively Irish. I really had no idea about these Irish potato pancakes until the Foodista newsletter appeared in my inbox earlier this week. Of all the Irish ideas and recipes suggested, these pancakes stood out for me due to its ease and simplicity. 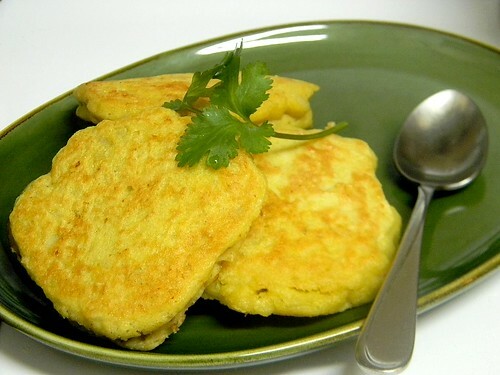 Boxty uses grated, raw potato and mashed potato with buttermilk and flour and, in this recipe’s case, eggs, although I’m sure that they could be easily substituted. These are fine-grained pancakes with a nice amount of rise. It’s almost fried bread, really. 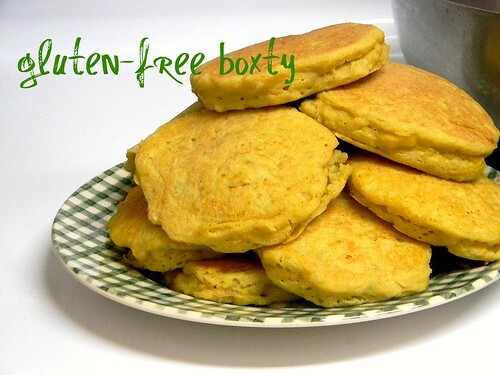 Boxty can be eaten plain or as a side with other Irish fare. Usually they’re served with bacon. They’re also good with ketchup. Mix the grated potato, mashed potato, and eggs together in a medium bowl (I used a small bowl, but a size up would be better for more ease in mixing the batter). Stir in the flours and baking powder into the potatoes until fully mixed, it will be dough-like. Pour in the milk and stir. Heat a fry pan over medium heat with some oil or butter. 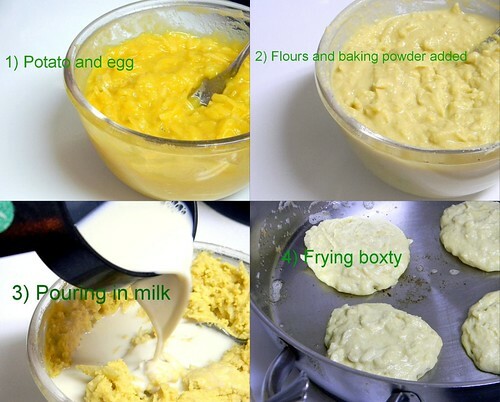 Spoon the batter into the pan, four at a time depending on pan size, two spoonfuls for each pancake. Fry until the bottom is golden brown and flip, cooking the other side until also golden brown and the pancakes have puffed. Transfer to a plate and serve. Enjoy! Hi Janet, you’re most welcome. I hope that they were a hit!